24-year-old, Nick, a technician at Lotus Cars, was part of Joe Harris’ junior cricket ‘academy’ at Mulbarton, where he lives. He joined Great Melton in 2014 having previously played for Keteringham Hall and Bunwell. Nick bowls with a fair bit of pace and enough bounce to worry batsmen and he’s no slouch with the bat himself. In 2013 he hammered a magnificent 174 not out for Bunwell against Kirkley. 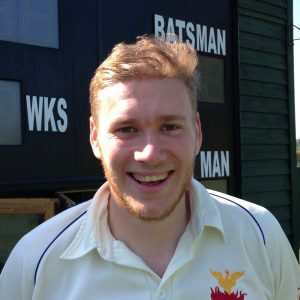 In his first season at Melton Nick flitted between the B (7 games), A (2 games) and 1st Teams (2 games) but, in 2015, a leaner and fitter Nick cemented a 1st Team place with 16 wickets and 184 runs including a top score of 57 not out. Last season saw him take 22 wickets for the Firsts but he was also instrumental in the Sunday & Midweek Teams enjoying such a good season. One of the highlights was his unbeaten 47 that helped knock a strong Swardeston team out of the Hunts Bat Cup. His full stats to date are: 67 appearances; 801 runs with a highest score of 83; and 76 wickets at 21.36. Nick has also got involved with the club off the field as a member of the Social & Fundraising Sub-Committee. Last year he organised the Six-A-Side and, as Governor Mack, he’ll be escorting a few Melton jailbirds on tour to Baldock in late May. Nick’s winter sport is football.